Marcus Eriksen, cofounder of 5 Gyres Institute, reports that all of the 12 water samples collected in the 3,000 miles between Perth, Australia, and Port Louis, Mauritius (an island due East of Madagascar), contain plastic. "We did find another large concentration of plastic debris," says the marine scientist who cofounded 5 Gyres Institute with his wife, Anna Cummins, to research plastic pollution in the world's oceans. The team works in collaboration with Algalita Marine Research Foundation and Pangaea Explorations. 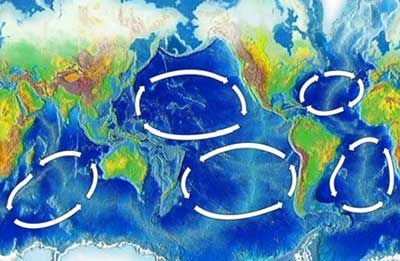 The five large subtropical gyres (powerful rotating ocean currents) are located in the North Pacific, South Pacific, North Atlantic, South Atlantic, and Indian oceans. Once plastic makes its way into the ocean (through sewers, streams, rivers, or from the coast), it is ultimately swept up and trapped in these gyres and forms a swirling soup of garbage. This Indian Ocean garbage patch discovery means there are now three confirmed ocean zones of plastic pollution, and Eriksen and Cummins expect to find others in the South Pacific and South Atlantic gyres also. The 5 Gyres Institute, a team of scientists and educators, will lead eight expeditions to explore the South Atlantic (starting later this summer) and South Pacific (scheduled for next spring). It's hard to visualize what these multiplying zones of plastic pollution look like. Cummins says there is a common misconception that a Texas-sized island of garbage exists off the coast of California. "There is no island of trash," says Cummins. "It's a myth." Instead, she says the garbage patches resemble plastic soup or confetti. "We now have a third accumulation zone of plastic pollution that shows compounding evidence that the trash isn't condensed to an island," she says. "It's spread out across the entire gyre from coast to coast. The world's oceans are covered with a thin plastic soup that's thickest in the middle of the gyres." It would be far easier to clean up the oceans if the trash were forming islands, Eriksen explains. In his opinion, it isn't practical to try to recover the plastic from sea because most is fragmented and widely distributed. The best solution, he says, is to collect debris that washes up on beaches, which act as natural nets, before it washes back into the ocean where it poses significant health risks for fish, seabirds, and other marine animals that mistake small plastic pellets for food or get tangled in discarded fishing nets. "If you stand on island beaches and mainland coastlines, you can watch the plastic coming to you.Â That's where gyre clean up makes the most sense," Eriksen says, "but we need to stop the flow of plastic into the ocean." What can we do help prevent this plastic soup from growing larger? We can look for the new degradable bioplastics to replace conventional petroleum-based plastic. We can choose reusable items over disposables and buy less plastics overall. For more ideas, check out what you can do to stop marine debris from Ocean Conservancy.